Road work will continue next week on several local roads in the Township, with a mill and overlay scheduled to begin on or about Monday, July 18, on sections of Rhode Island Ave., Parkwood Drive, Surrey Road, Oak Avenue, St. James Place, Evergreen Avenue, Belmont Drive and Hialeah Drive. All work is being done by the Department of Engineering as part of the Township's annual Road Maintenance Program. More than 55 roads are scheduled for reconstruction this year, as part of the program. Work on all roads will include road resurfacing, as well as isolated sidewalk and curb replacement where necessary. Trash pick-up will not be affected by this work; however, our contractor will notify residents in the event parking is limited by construction. All work is weather-permitting; residents with questions or concerns can contact the Department of Engineering at (856) 424-3203. My administration and Town Council continue to prudently invest in our town's infrastructure, and are continually working to ensure that our roads are smooth and safe for travel. Click here to learn more about our Road Maintenance Program. PSE&G will be working in Cherry Hill over the next several weeks to replace older gas pipes with new, durable plastic and/or coated steel piping as part of a statewide project to replace 510 miles of aging gas lines. Officials from the utility company say the new pipes will improve reliability, reduce the possibility of methane leaks, and enable the installation of excess flow valves on service lines, which reduce gas flow if a pipe is damaged. The new lines will also provide better support for high-efficiency appliances like furnaces and water heaters. Work will begin on or about Monday, July 18, and will take place from 7 a.m. to 6 p.m. daily, conditions permitting. Click here for details. Lane restrictions will be in place on Monday on Haddonfield-Berlin Road near Route 295 to accommodate repairs being conducted by PSE&G. Motorists should be prepared for traffic pattern changes, allow extra travel time, and use caution when driving through the construction zone. Residents with questions or concerns can contact PSE&G at (856) 573-2015 during regular business hours. On Wednesday, July 20, Cooperlanding Road will be closed to southbound traffic between Route 70 and Chapel Avenue, with local detours in place. This work is part of an ongoing project to repave the roadway from Route 70 to the Route 38 circle. Residents with questions or concerns about this project should contact the Camden County Department of Public Works at (856) 566-2980. Several members of the Cherry Hill Police Department traveled to Dallas this week to honor five officers killed in the line of duty last week. The Cherry Hill Police Department and Chief William Monaghan have been overwhelmed this week by the amount of support our officers have received from members of the Cherry Hill community following a very difficult week for members of the national law enforcement community. Our officers were contacted and visited by residents, business owners, community groups and religious organizations alike - support that means an immeasurable amount. As a Township, our hearts and thoughts are with all those affected by senseless violence in our world, particularly in recent weeks, and we stand in unity with the individuals, cities and communities whose lives have been touched. On a personal note, I want to acknowledge the work the men and women of our Cherry Hill Police Department do every day to keep our community safe, secure and strong. It is a true example of successful, inclusive community policing, from the top of the organization to each and every patrol officer. Thank you to Chief Monaghan and our men and women in uniform, and thank you to the citizens who have shown their support in the last week, and always. Click here to read about the outpouring in the Cherry Hill Sun, and click here to stay up-to-date on the department through Facebook. From left: Librarian Claire Schmieder, Mayor Cahn, Hunter's Heroes founder Claire Hunter, Fire Commissioner Kellie Montana and Battalion Chief Jason Houck accept the 25-book donation. Mayor Cahn stopped by the Cherry Hill Public Library on Monday night for a special Thank a Firefighter event, hosted by the Library and the Hunter's Heroes Foundation. As part of the event, Hunter's Heroes donated 25 fire-related training books for fire responders to the library, which will become a part of the Library's permanent collection. These books are essential for current firefighters and those planning a career in the field - but many can be expensive and hard to find. It was a wonderful evening, featuring the book presentation, as well as a meet and greet with members of the Cherry Hill Fire Department and a truck display outside the library for children and residents of all ages. Hunter's Heroes is a nonprofit organization created to help libraries offer books to firefighters and fire officers for training purposes, started in memory of Lt. Christopher Hunter, a Cinnaminson firefighter who passed away in 2014. Training and education were a passion of Lt. Hunter's, and his wife, Claire, founded the organization in his memory. Thank you to Claire Hunter and Hunter's Heroes for their incredibly generous gift! Learn more about Hunter's Heroes at www.huntersheroesfoundation.org. Join Cherry Hill Recreation and Lourdes Health System for a free, four-week, Yoga in the Park series at Croft Farm, continuing this Saturday, July 16. This beginner-level class is open to all, and yoga is a wonderful activity for those with diabetes, high blood pressure, high cholesterol and heart disease, and helps everyone to build strength, flexibility and mind/body awareness. Classes will be held every Saturday in July from 8 - 9 a.m.. Please bring your own mat and water. For more information click here. Registration in advance is required. You can also contact the Cherry Hill Department of Recreation at Recreation@CHTownship.com or call (856) 488-7868. Dozens of families turned out for our first Pop-up Storytime on Friday at Ashland Park. Get the kids ready and head on over to one of our local park on Fridays in July and August for a special outdoor Pop-up Story Time, brought to you by Cherry Hill Recreation and the Cherry Hill Public Library! More than 50 people turned out this Friday morning for our inaugural storytime, hosted at Ashland Park. The program will continue each week through Aug. 12, with stories and fun with CHPL’s Librarians. Story time runs from 10 to 10:30 a.m.; visit Cherry Valley on July 22; Erlton on July 29; Kresson Woods/Haddontowne on Aug. 5; and Old Orchard on Aug. 12, weather permitting. Click here for photos. For more information, visit www.chplnj.org. Discuss the book 'eat dirt,' 7 p.m. July 20 at Inkwood Books in Haddonfield. 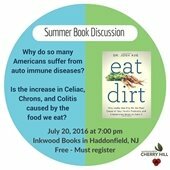 Sustainable Cherry Hill’s Green Health Task Force’s summer book discussion features "eat dirt" by Dr. Josh Axe, 7 p.m. Wednesday, July 20, at Inkwood Books in Haddonfield. Do you know someone with auto-immune disease? Ever wonder why so many Americans suffer from Celiac, Crohn’s and Colitis? "Eat dirt" explores how modern improvements to our food supply have damaged our intestinal health. and how things like refrigeration, sanitation and modified grains have affected us. To learn more, or to register, click here. For many of us, summer is vacation time, and no vacation would be complete without a great book! As it does every year, the Friends of the Cherry Hill Public Library is hosting its July Book Sale through this Saturday, July 16, at 1100 Kings Highway North. Public sale hours continue until 5 p.m. Friday, July 15; and again from 9:30 a.m. to 4 p.m. Saturday for $5 Bag of Books Day. Thousands of books, CDs and DVDs will be offered; hardbacks, CDs and DVDs are $2, while paperback books are $1. All proceeds benefit the Library. For more information, call (856) 667-0300 or go to www.chplnj.org. Elizabeth White, the daughter of a New Jersey farmer, and Dr. Frederick Coville, a USDA botanist, harvested and sold the first commercial crop of blueberries out of Whitesbog, N.J., in 1916. Judith Krall-Russo will present the history of the “swamp huckleberry” and why it’s touted as a wonder fruit with a host of healthful benefits. Judith will also share a variety of ways to prepare and savor these berries. Click here to register. Raising money never tasted so good! Stop by PJ Whelihan's in Cherry Hill (1854 Rt. 70 East) for drinks or dinner and 15% of your total bill will be donated to the Cherry Hill Public Library. Be sure to mention the library to your server so your donation is applied!